The main advantage of traveling with us is that 4WDs also called 4*4, are specifically allocated for tourists. It means that you can visit special sites plus there are a few people along, so the probability of upcoming problems, like differences in ideas that happen in group tours, won't happen in ours. The moment you join our tour, you would be carried with specific cars. It is good to know that adventure trucks are fully stocked before every tour. 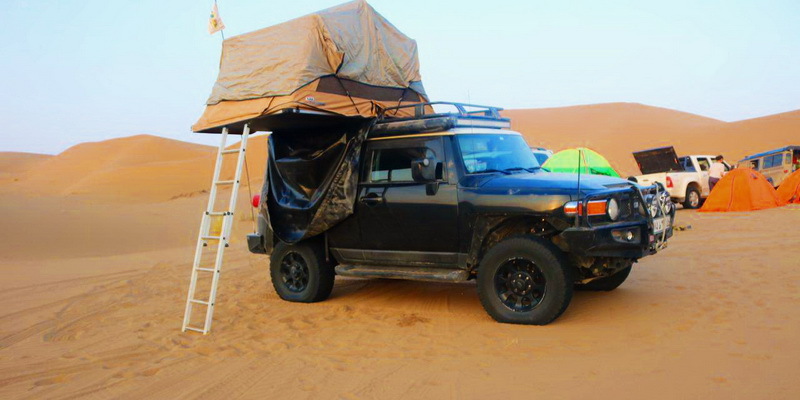 Jam-packed with everything from tents and chairs to bats and balls, the vehicle is made ready for epic adventure. • When the destination is a little far, you may get bored so we provide a collection of books to read and a table for those who want to play board games. There are also a selection of bats and balls, Frisbees and other toys to keep you entertained. • There are also charging facilities on the truck for the needed time, but we recommend that only make use of these facilities while the truck is plugged into a land supply at a camp site due to variable currents and potential damage to the equipment. • You may be obsessed about the food which is catered on the way, don't worry because there are fridges on all trucks which are used by the chef to ensure that the food stays fresh. • Everyone carries some items that needs to access them quickly, so the trucks have overhead shelfs. • Canvas camping chairs for the time you want to sit around the fire and talk about what has happened and reminiscing and enjoying. • To enjoy your dinner around in the evening, trestle tables and table cloth are provided for you. • Custom made from the best quality available on the market, 2.5 * 2.5 meter canvas tents, are provided for the time of camping that the weather gets rainy or windy. . If you do not enjoy getting wet, please be very sure to check the seasons that you are travelling in and perhaps consider altering your travel date or choose for an accommodated tour option. • For a nice and comfortable sleep, foam mattresses are used for you. • For preparing food, kettles, pots and crockery are available. Gas burner and barbeque equipment are also provided. • To provide you safety and ease, we carry safety equipment like first aid kits, fire extinguisher, 200 lit water tank and tire changing equipment. • Dear tourists should know that all the routes have been surveyed in advance so there would be no problems on the way. • All the trucks are equipped with the recovery things like winches, spare tires, lift jack etc. To guarantee your comfort and safety on the way, there is a backup truck in every region to help in the case of need. So, if you choose our tour, the only thing to do is to enjoy.